The 2-door, 5-passenger 2017 Dodge Challenger blends classic muscle-car flavor with modern safety and technology including a 5-star crash-test rating from NHTSA, available all-wheel drive and up to 707 horsepower. Its long-hood/short-deck style links back to the Dodge Challengers of the early 1970s, and under-hood choices range from a 305-horsepower V6 to three versions of Dodge's legendary Hemi V8. Easy and comfortable to use and safety features is guaranteed good. It is the vehicle of my husband, Dodge challenger 2017. It is very nice and automatic easy to use and can my husband told me it is very economic, I super love the color burgundy and high speed, easy to use and very safe and secure. And also there is manual and automatic and it is really light when you driving on it you are very comfortable and very relax. I love the safety measures and features of it. I love it so much it is very sporty. Where ever you can go, whenever you want. The problem is my husband while he is at work it doesn't run, or there is something problem in the engine, he called someone to help him fix it, he came home late. There is no perfect things in this world but for me it is very car. The color of my vehicle is go mango and everywhere I go I get compliments on it! It is a very comfortable car to take on long road trips. It is very spacious and easy to handle. It has a very clear and helpful back up camera. It is not great on gas mpg which is expected when using a larger vehicle but it is also not horrible! I love driving my car! The interior has a super modern look to it, including:. A large touch screen, leather accents, digital speedometer, power adjustable seat, light dimming rear view mirror and much more!! My Dodge challenger is my dream car and I wouldn't trade it for any other vehicle. I am extremely pleased with my purchase! 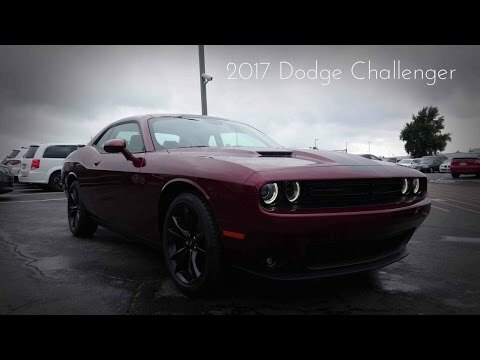 2017 Dodge challenger is a great vehicle! No problems at all! Its is a great car, very reliable. Also super comfortable, took it on a road trip from Florida to Virginia and it was very nice! My dog (German Shepherd) even came along and had the whole back seat to herself and she seemed awfully comfy as well! I also drive it around town a lot and it's very good on gas, and like I said before very reliable. By far the best car I have had.